The United States Customs and Border Protection agency is about far more than simply curbing the influx of illegal immigration and undocumented workers into the U.S. In fact, The primary focus of CBP agents is to keep the country safe by preventing dangerous weapons and people from entering the nation's borders and fighting to reduce the growing and horrific crime of human trafficking. There's a lot that goes into preparing someone for such a worthwhile job, so it's worth finding out exactly how to become a U.S. Border Patrol agent. Be a United States citizen and currently live in the United States. Be under 37 years unless you have prior federal law enforcement experience or are a military veteran. If you meet the minimum requirements, the first step is to apply for the job. You can do so by visiting USAJOBS and searching for Customs and Border Patrol Opportunities. If your application meets muster, you'll progress through a series of steps that include physical and written testing, a background check, a polygraph exam, an oral interview process and finally training at the U.S. Border Patrol Academy. At the time you apply for a U.S. Customs and Border Patrol agent job, you'll also register to take the U.S. Border Patrol Entrance Examination. The test consists of four sections that measure your math and logical reasoning skills, writing skills, and your past experiences and achievements. The test takes about 5 hours to complete and is available at various locations throughout the United States. To pass the written test, you'll need to achieve a score of at least 70 percent. In addition to the test, you will also participate in a Spanish language assessment to determine your ability to speak or learn to speak Spanish. Once you pass the written exam, you'll move on to the first of two physical assessments. Vision must be 20/100 or better in each eye and correctable to 20/20 with lenses. You must have normal color, peripheral and depth perception. You must have adequate hearing in both ears. You must not have any physical impairments that could pose a danger to you on the job. You must be in good health and your blood pressure must be within the normal range. If you're not yet in shape, start working now to get yourself where you need to be. The above minimums aren't overly taxing, but they can be difficult for someone who is not accustomed to physical activity. Consult with a physician before beginning an exercise program, and then start a regimen that can put you in the best position for success. If you make it far enough in the process, you'll undergo a very thorough background investigation. The background check will include criminal histories, prior employment, references, training, and education verification and a polygraph exam. It is extremely important to understand that if you have any inclination toward working in any criminal justice career, you need to refrain from doing anything that could jeopardize your chance of getting hired later on down the road. If you can make it through all the hoops, you'll move on to the United State Border Patrol Academy in Artesia, New Mexico. The academy consists of 58 days of training in physical fitness, U.S. immigration law, firearms marksmanship, defensive tactics, and other law enforcement-related subjects. For those not fluent in Spanish, after you complete the 58-day basic academy you'll attend another 40-day Spanish language course that will consist of instruction and immersion in the language. If you are not functionally fluent in Spanish at the end of the course, you will not be able to continue with the agency. Now more than ever, keeping the nation's borders safe and secure for U.S. citizens, visitors and immigrants is vitally important. 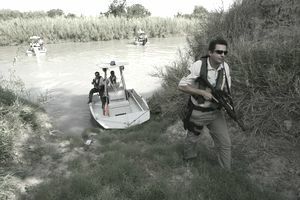 As the crime of human trafficking is on the rise and concerns of potential international terrorist attacks remain, U.S. Border Patrol agents stand on the front lines to maintain the integrity of the country's borders. If you'd like to be a part of keeping the nation secure while helping some of the most vulnerable among us, you should definitely consider a career as a U.S. Border Patrol Agent.